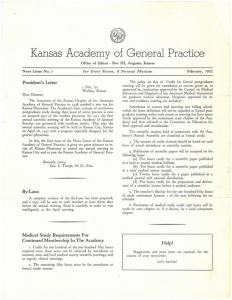 The Kansas Academy of General Practice (KAGP) is founded as a state chapter of the American Academy of General Practice (AAGP) on May 6, 1948. 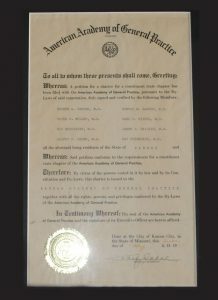 It is the eleventh state to receive a charter from the AAGP. Charter members were: Eugene A. Reeves, MD; Clyde W. Miller, MD, who serves as the first KAGP president; Ray Meidinger, MD; Albert C. Harms, MD, the fifth president; Conrad Barnes, MD, the ninth president; Carl D. Siegel, MD; James P. Haigler, MD; and Ray Busenbark, MD. 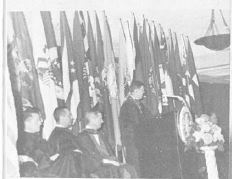 Elections were held at the second KAGP Board Meeting in Wichita, Kansas on Nov. 14, 1948: Dr. Clyde W. Miller (president); Dr. L.B. 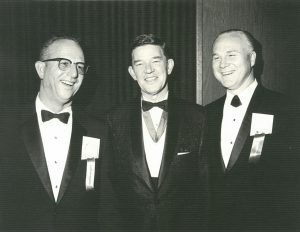 Clyne (president-elect); Dr. Charles L. White (vice president); Dr. Albert C. Harms (secretary); and Dr. George L. Thorpe (treasurer). Forty-one members gathered for the first Annual Meeting in Kansas City. Election of officers were held and Dr. Clyde Miller is presented with a gold past president’s key as an annual observance. After-dinner speakers include a Kansas City Star reporter/writer and a representative from the AAGP. The first KAGP Scientific Meeting is held at the Broadview Hotel in Wichita, Kansas in conjunction with the second annual KAGP Meeting. The lectures presented are “Nutrition in the Surgical Patient” a panel presentation on peritonitis; and “The Problems of General Practice.” A banquet follows the meeting, with installation of the president and all other officers. 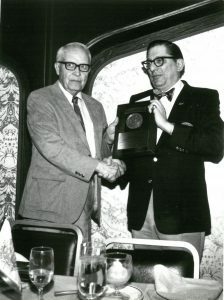 Gene Wilcox (left) receives a plaque for his 35 years of service. 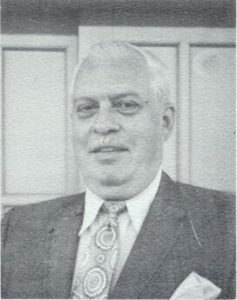 Mr. Gene Wilcox of Winfield, Kansas is named the KAGP Executive Secretary in August 1951 on a part-time basis to recruit members, execute the annual meeting and assist with the newsletter. Mr. Wilcox serves the Academy for 35 years. 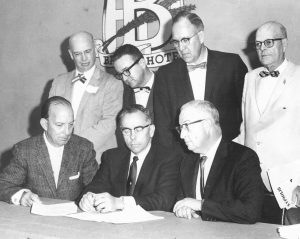 The 10th Annual Meeting, held in Hutchinson, Kansas at the Baker Hotel, opens with an “Oyster on the Half Shell and Keg Party.” The theme, ” We can each get one in’ 61″ is adopted for the 1960-61 year to encourage the recruitment of members. KAGP membership is up to 418 active members and 18 out-of-state members, placing Kansas 20th in the nation. 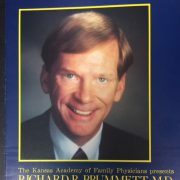 A 1962 report at the annual business session revealed that there were only three general practice residents in Wichita hospitals and 18 percent of medical school graduates choosing general practice, a troubling drop from 25 percent reported a year earlier. This concern prompted the board to prepare a resolution encouraging the government to exempt young physicians from military service. George “Ned” Burket, Jr, MD is installed as AAGP President. 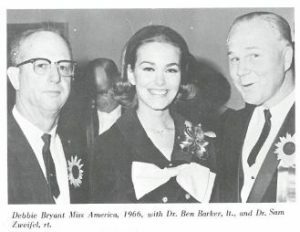 Dr. Burket is pictured (middle) in 1967. 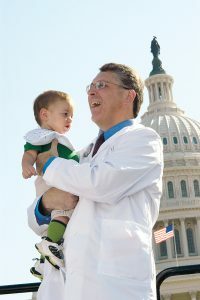 Dr. George N. “Ned” Burket, Jr. is the first Kansan elected to be president of the American Academy of General Practice. So many Kansans traveled to Boston for the AAGP Meeting to support Dr. Burket’s campaign that Kansas received an award for 2nd place in increased attendance at the national meeting! The hospitality room for Dr. Burket featured short ties as favors for the men and coin purses and scarves for the ladies. Miss America 1966, Kansan Debbie Bryant is the featured guest speaker at the 16th Annual Scientific Assembly banquet. She shares stories about her year as Miss America and her plans to study medicine. Family Physicians, P.A. is not your usual hospital residency! While a part of Wesley Hospital, Family Physicians, P.A. 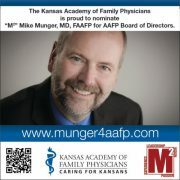 is the first non-university related Family Practice residency established in Kansas and the second FP residency in the country. The program opens under the leadership of Residency Director Dr. G. Gayle Stephens and Drs. Stanley Mosier, Conrad Osborne and Victor Vorhees. 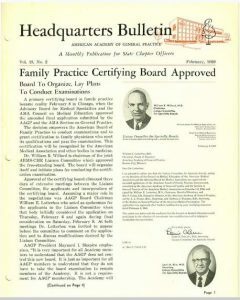 Family Practice is approved as American medicine’s 20th specialty in February 1969. The first certifying exam is held February 28-March 1, 1970 at 36 centers throughout the country – 81 percent of the 2,078 physicians in the United States who take the examination pass. 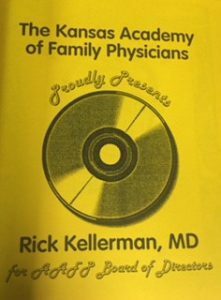 The new specialty of Family Practice is on its way. Opening of the new St. Joseph Family Practice Residency Program (now Via Christi St. Joseph) is another mark for the specialty. The new residency program is under the direction of Dr. James. Donnell. 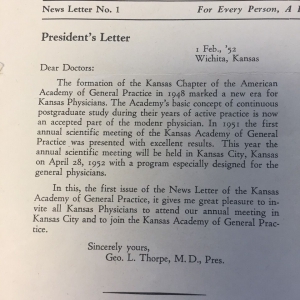 Following the AAFP’s lead, the Kansas Chapter changes its name from the Kansas Academy of General Practice to the Kansas Academy of Family Physicians with a resolution at the 21st Annual Meeting in Manhattan, Kansas, in September 1971. Dr. Jack Phipps wins the election for AAFP Board of Directors and Dr. George E Burket, Jr., is elected to the American Board of Family Practice Board of Directors. At the national meeting, Kansas receives first place at the Idea Fair for its public relations campaign featuring radio and TV spots and “The Doctor’s Answer” – a medical column printed in 40 Kansas newspapers. The 2nd Annual Coke Party (Coca Cola was all the rage in ’72!) is a success with students, enrolling 157 as members. Drs. Jacks, Goering and Walker spoke to the group. Dr. Jacks’ remark, “some men walk a mile for a camel, but I drove 300 miles for a coke” goes down as the quote of the evening. 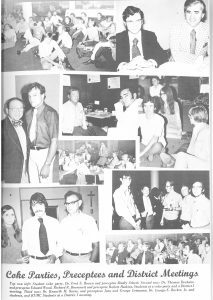 A bylaws change in 1972 allows membership for osteopathic physicians. Kansas participates in a pilot study for computerizing credit hours at the AAFP office. Physicians carry computer cards to CME meetings and their hours are automatically added. 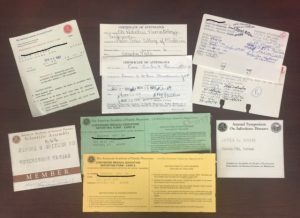 Various CME cards through the years. 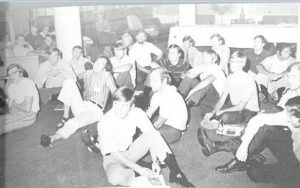 The 25th KAFP Annual Meeting, held June 6-8, 1975 in Manhattan, Kansas is filled with three days of “The Pioneer Physician” theme-related activities. Attendees dress up in costume for the sports night dinner, which features prizes for the best Gunsmoke characters “Doc Adams and Kitty.” The hobby display features a gun collection and members bring their hobbies to share. Sports day activities include a bass tournament at Milford Reservoir, golf, trap shooting and tennis. The ladies enjoy a tour of the McCall’s pattern factory. The scientific program includes topics on alcoholism, pharmacology, religion in family practice. The honored guest is AAFP President-Elect Dr. Carl Hall and the banquet entertainment is a melodrama by the Manhattan Theatre Group. Dr. Philip Hostetter is installed as the 1975-76 President. 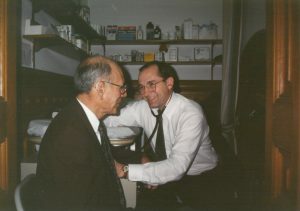 KAFP initiates the Doctor for a Day program in 1979, now named the Family Doctor of the Day program, through which members volunteer to serve a day at the state capitol taking care of medical needs there. 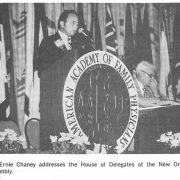 The Academy developes a nonprofit foundation to receive donations to further family practice education and research in 1983. 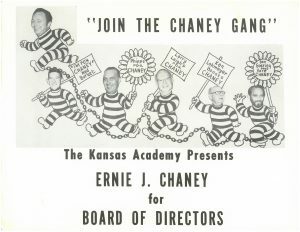 The original name is the Health Foundation of Kansas. It later changes to KAFP-Foundation. 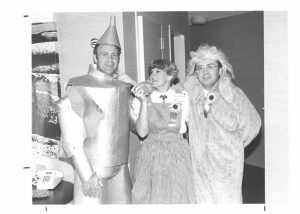 Characters from Kansas the Land of Ah’s: Tinman, Larry Anderson, MD; Dorothy, Vicki Copening and the Cowardly Lion, Tell Copening, MD. Lion, Tigers and Scarecrows Oh My! 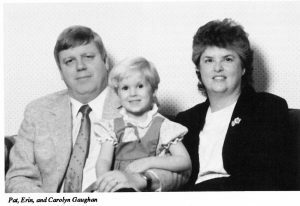 Carolyn Gaughan, CAE, Wichita, Kansas is named the new KAFP Executive Director. She continues in that role…29 years now, and counting! 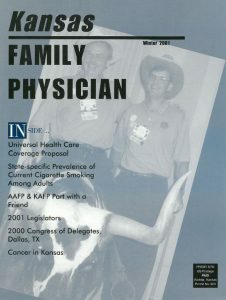 KAFP changes the name of its official publication from the Jayhawk Family Physician to Kansas Family Physician in 1999. One for the Money. Two for the Show. Three to get Ready. Go, Kman Go! 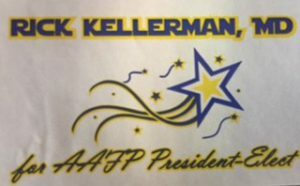 Rick Kellerman, MD, FAAFP, Department Chair, University of Kansas School of Medicine, Wichita, Kansas is elected to serve on the AAFP Board of Directors. His campaign theme is Rock & Roll with Rick! “Elvis” is in the house along with “Marilyn Monroe” for the hospitality suite. The KAFP is deeply involved in gaining passage of the Clean Indoor Act, allowing all Kansans to enjoy a smoke-free environment in the work place. Mike Munger MD & Carolyn Gaughan attend the ceremonial signing at the Capitol. 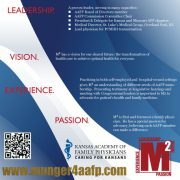 KAFP receives a major grant funding to focus on the Patient Centered Medical Home initiative in 2010 – 2013. Efforts include a public relations campaign, educational programs including three PCMH Summits, and a pilot project with 10 practices to transform into PCMHs. In recognition of its key role in tobacco issues, KAFP accepts the opportunity to be the Chronic Disease Risk Reduction (CDRR) grantee for Sedgwick County, which covers tobacco cessation & prevention efforts. KAFP hires Tobacco Coordinators Kim Neufeld & Tara Nolen to head the effort. KAFP-Foundation conducts its first-ever Strategic Planning Session in September 2017, in recognition of its growth and increasing stability. KAFP-Foundation sets “signature programs” and redirects its focus to resident and student programs and activities. In January 2018 the KAFP Board takes action to change the mission statement to sharpen its focus. 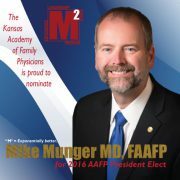 The new statement says: The mission of the KAFP is to support and serve family physicians of Kansas as they advance the health of Kansans. Many other changes occur over the years with fresh ideas, programs, volunteer leadership, staff, and focus. 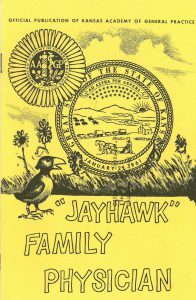 What stays the same are efforts to provide quality education, advocacy and support for the family physicians of Kansas as they continue to care for Kansans, now for more than 70 years.